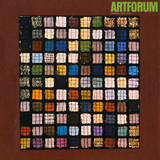 I regret to record several errors in my article “Color, Culture, The Stations: Notes on the Barnett Newman Memorial Exhibition,” Artforum, December 1971. Cathedra was reproduced upside down, as was Profile of Light: in the latter case I followed uncritically the labeling of Knoedler and Co.
Mr. Thomas Hess has kindly pointed out to me that the painting captioned The Name, I, is, in fact, the picture titled Yellow Painting in his exhibition. This discrepancy arose from my using a photograph given to me by the artist, inscribed in his hand: “The Name, Barnett Newman 1949.” On page 32 the date 1964 should read 1954 as I hope is clear from the context.